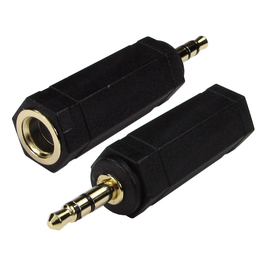 Standard 3.5mm stereo male to 6.35mm stereo female adapter allowing you to connect 3.5mm stereo equipment to 6.35mm stereo equipment or vice versa. Gold flashed for a high quality finish and anti-corrosive properties. These type of connectors can also be referred to TRS or Tip Ring Sleeve.